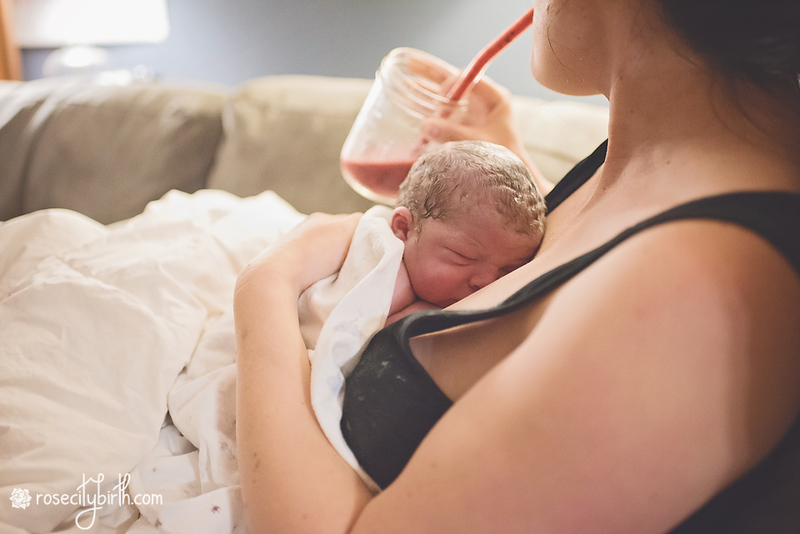 Forward: In this story I describe a very quick home birth. I include some "graphic" events for two reasons: the first is because without them there isn't much to tell. The second reason is that this is birth and birth is messy. I use words like "perineum" and I briefly describe how a person came out of me. If that's not your cup o' tea then I suggest skipping forward to the beautiful images. They aren't *too* graphic. Each image is captioned with a description. Enjoy! It was early on a Saturday morning. The last couple days I had felt great: no contractions in the evenings like I had earlier in the week, my hip/back pain had let up a bit, I had more energy. So of course I felt like this baby was going to take his or her sweet time getting here, despite my midwife being convinced the birth could take place at any moment based on how low baby was in my pelvis at my appointment on Tuesday. So when I got up to go to the bathroom early Saturday morning at 2:30 (for some reason I made a point of looking at the clock which I usually don’t do at such early hour) I thought nothing of it because I had been getting up several times at night to pee, as most heavily pregnant women do. And of course I couldn’t get back to sleep after that either but I felt fine – no contractions, normal movement of the baby, etc. Then it must have been around 3 AM (based on subsequent events) when I had what I now realize was a contraction. At the time I just thought I had to poop reeeeal bad. (Birth is a mixture of beauty and bowels, isn’t it?) I had to breathe heavily through the cramping but not really vocalize. Our 3 year old daughter came in and climbed over me to snuggle as the contraction was dying down. She nuzzled up to daddy as I got out of bed and headed to the bathroom. I got to the bathroom and did my business, but suddenly the pressure shifted forward and I had what I knew even then to be a real contraction. I had to vocalize deeply through it and I called out for my husband. He came running and asked if he should call the midwife. I said, “Yes, the baby is coming!” This was at 3:16, based on the timestamp from his phone call. He also called my friend who had so graciously offered to help with our children and be our photographer. Our 12 year old son heard the commotion and came out of his room to see what was going on. He hung around cautiously, watching as my husband moved the birth tub into position in the living room and started filling it. Meanwhile I had two or three more quick and close contractions in the bathroom. Through each one I made a low uhhhhh noise and then I sang higher ahhhh as they faded. As the birth team began rushing to our house, my husband told me he was filling the tub and I told him to forget about it, there’s no time. “No, I’ve got this!” He knew a water birth was important to me and he was determined to make it happen! I asked him to put the birth blanket on the living room rug and I waddled my way down the hall, determined not to give birth in the bathroom! Our son watched from a slight distance, trying to decide what to do with himself. I knelt on the blanket as another contraction made its way over me. The need to push was strong, impossible to fight off even if I wanted to. I felt a bulge and reached down to support my perineum. I pushed again, maybe two or three more times, as the head danced in and out while my perineum stretched. I felt confident, I felt in control yet sublimely aware that these events were totally out of my control. All I could do was let my body do what it was supposed to do. Even though things were happening fast I wasn’t afraid because… well because there wasn’t time or an immediate need to have fear. Eventually I clued my husband in to the fact that the baby’s head was coming out. He abandoned the tub project and got behind me to catch this baby. A couple more pushes and the head was definitely out. I asked out loud, yet rhetorically, “Why has my water not broken yet?” Another push and a shoulder was born. Then a pause for what felt like at least a minute but it was probably seconds. Another shoulder born. My husband said the cord was up over one shoulder. I asked if he could slide it down. He responded with a simple, yet complex, “Yes.” The tone in his voice was memorable – it was nervous yet calm, short on content yet full of the emotions of the moment. Finally, a contraction. Boom! A gush of fluid as the water broke, a release of pressure, the feeling of an empty womb. My husband called out, “It’s a boy!” He passed the baby under me as I snapped upright on my knees. I pulled his vernix-coated body to me and felt immense relief. 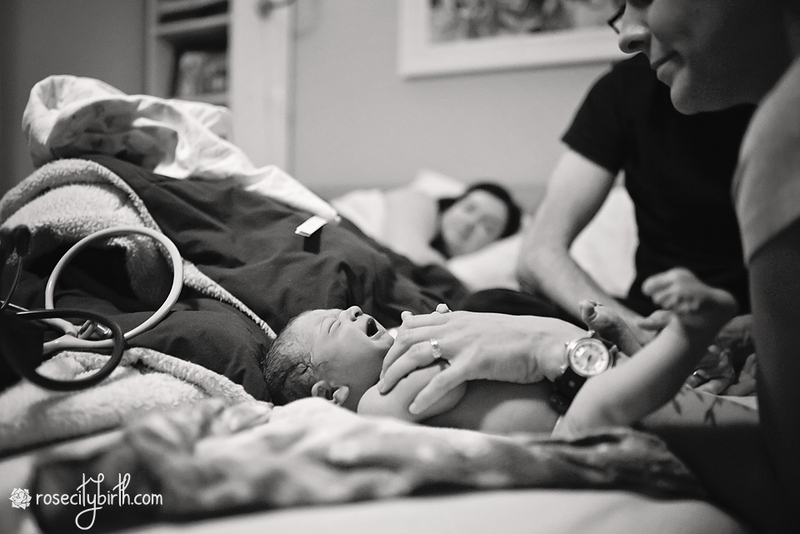 We had accomplished this birth together: my husband, my newborn son, and I. Normally that’s where birth stories end, but I feel like mine is just getting started here! I sat back against the living room furniture and my husband and I gazed at our fresh new being. A few minutes later the midwife arrived, apologetic, followed by the two assistants. 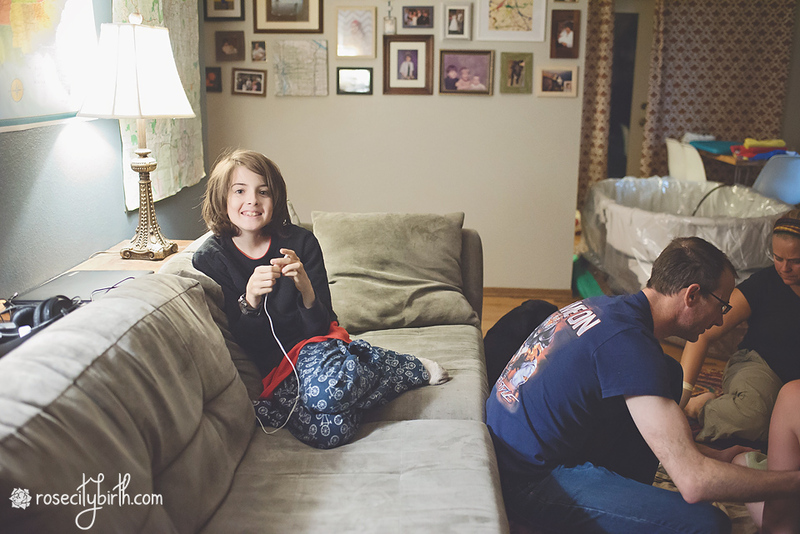 They gushed over the baby, helped my husband cut the cord, and started attending to my every need, helping me move my legs from the distorted lounging position they fell into. Minutes after that our dear friend and photographer/doula arrived, also apologetic. It felt amazing to be surrounded by these women who I trust with my care and support. They may have missed the actual birth but they really arrived at just the right time – I needed them most after my work was done. ​I’ll let these next few minutes tell themselves in pictures. Images are described in captions. In this image people are gathered in a low-lit living room with a grey couch and colorful rug. My back is to the camera and I'm sitting in the center, I'm a white woman with dark hair and I'm holding my newborn baby boy. In front of me sits my midwife who is a white woman with lighter hair. To the side of me sitting on the sofa is my husband who is also white with dark hair. Behind me is just the back of my midwife's assistant who is white with light hair. This is a black and white image of the same scene as above but now the camera is in front of me. Our eldest is son is now sitting on the couch. He is white with chin-length light brown hair. He is brushing his hair out of his face with his hands. My husband and I are smiling at the midwife whose back is to the camera. I'm holding our newborn baby to my breast. A similar scene to the above image but from another angle behind our midwife. An additional midwife's assistant is in view. She is white with light hair and wearing a dark hat. This image is in color and it focuses on our eldest son who is smiling at the camera. At the side of the image is the birth scene and an unused birth tub. This photo was taken with my back to the camera. My husband is holding a straw up to my mouth so I can drink while holding our newborn. My midwife's smiling face is in the background. In this color photo the birth scene is just off camera to the left. 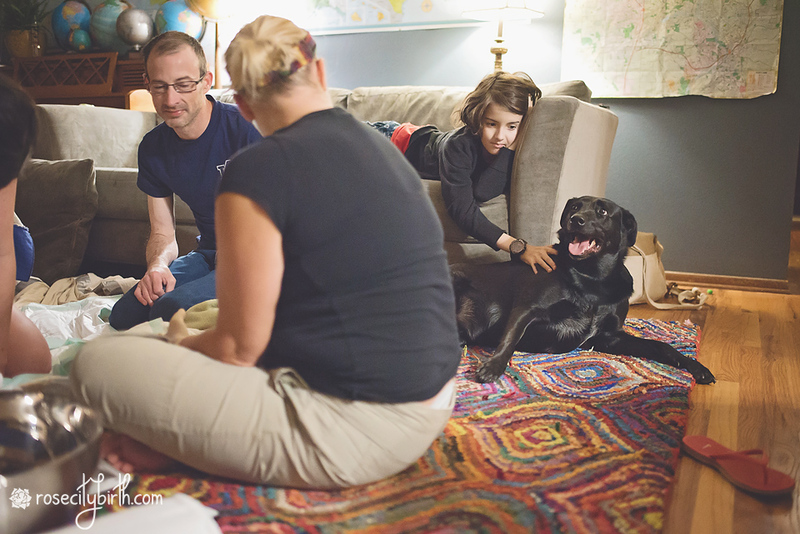 The focus of the image is our eldest son who is lounging on the couch and reaching down to pet our dog, Max, who is a small black Labrador. 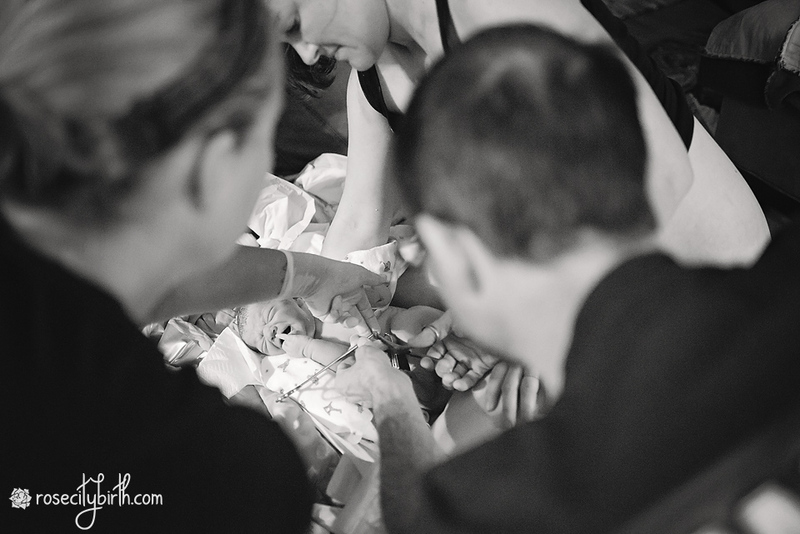 In this black and white image the birth scene is taken from above. I'm up on my knees and trying to get my baby to latch. In this image our newborn is laying on blankets while the cord is cut. 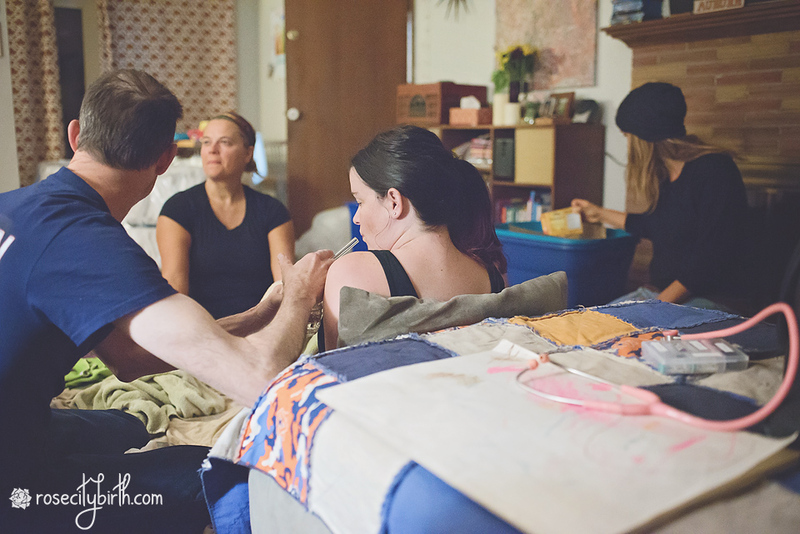 The photo is taken over the shoulders of my husband and my midwife. In this color photo I'm on the sofa holding our newborn and my husband is kneeling next to the sofa and smiling at us. Above us are pink streamers hanging from the ceiling which are leftover decorations from our daughter's birthday. Off in the background are the unused birth tub and a midwife's assistant. I also enjoyed a very yummy smoothie thanks to my wonderful friend Jenny (who also took all these amazing pictures). There is a special ingredient in the smoothie – can you guess what it is? This image is focused on our newborn baby who is skin-to-skin on my chest. I'm drinking a pink smoothie through a straw. In this image I'm still on the sofa and skin-to-skin but now drinking from a mug. On the other end of the sofa is my husband smiling at us. Roughly 90 minutes had passed since the birth. 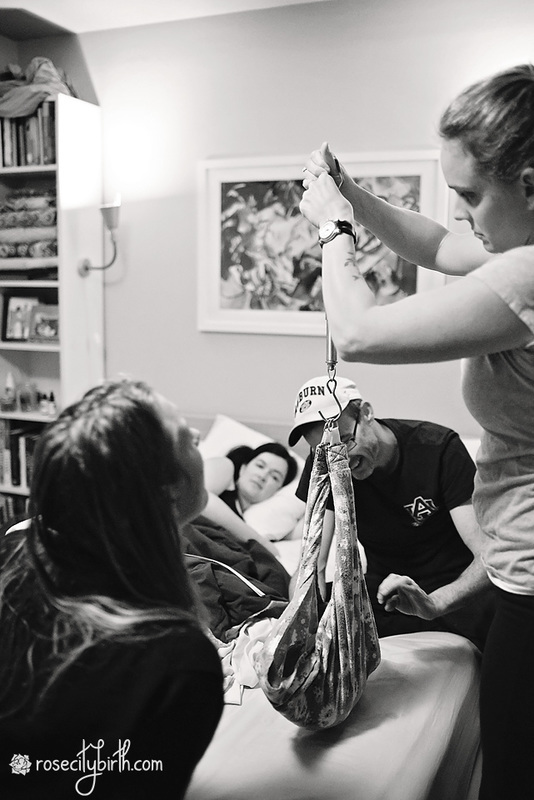 The team helped the baby and me move to our bedroom so we could get some rest and the midwives could do a quick newborn exam. 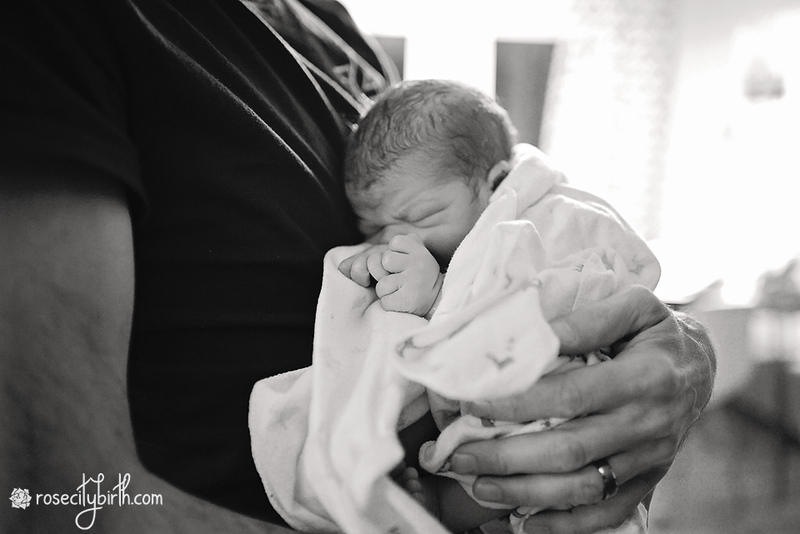 This image focuses on my husband holding our newborn in his arms. It is close-up on the baby craddled in his forearm. 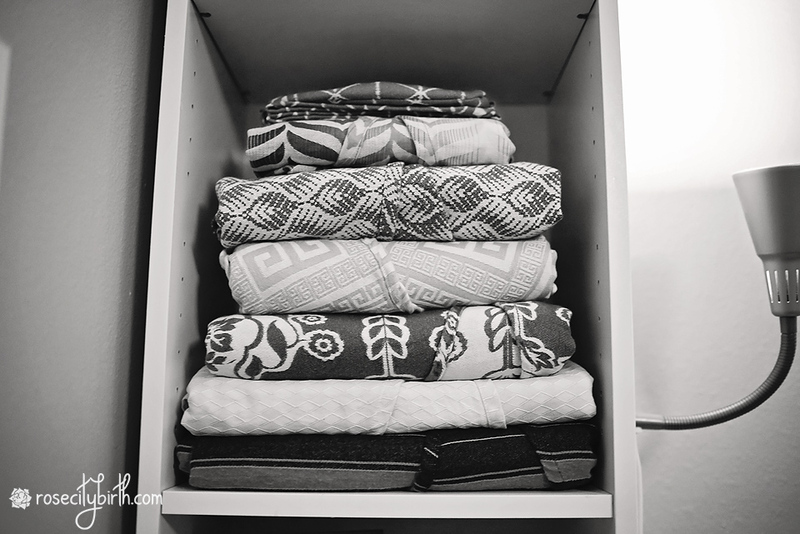 This is a black and white quote stash shot end quote of folded woven wraps on a bookshelf. 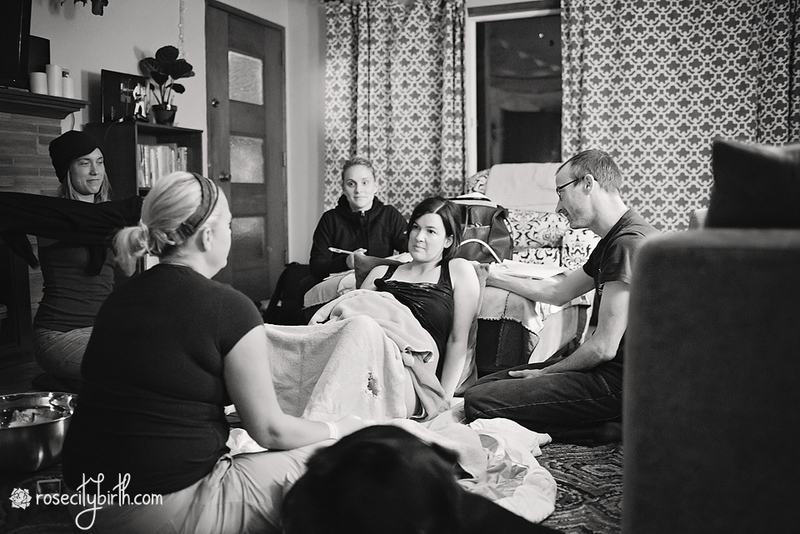 In this image our baby is lying on our bed in blankets while the midwife's assistant gives a newborn exam. My husband is seated on the bed and I am laying in the background. 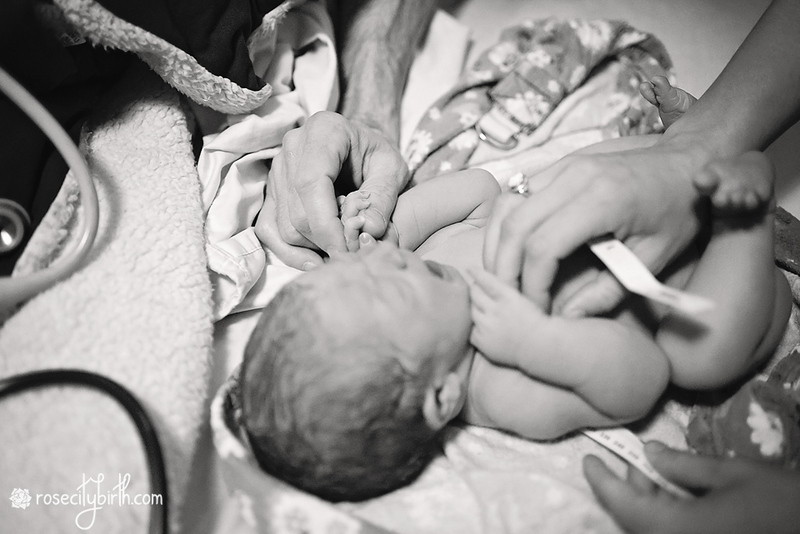 This image focuses closer on the newborn exam. Our newborn is grasping my husband's thumb. Our baby is being weighed by the midwife's assistant. 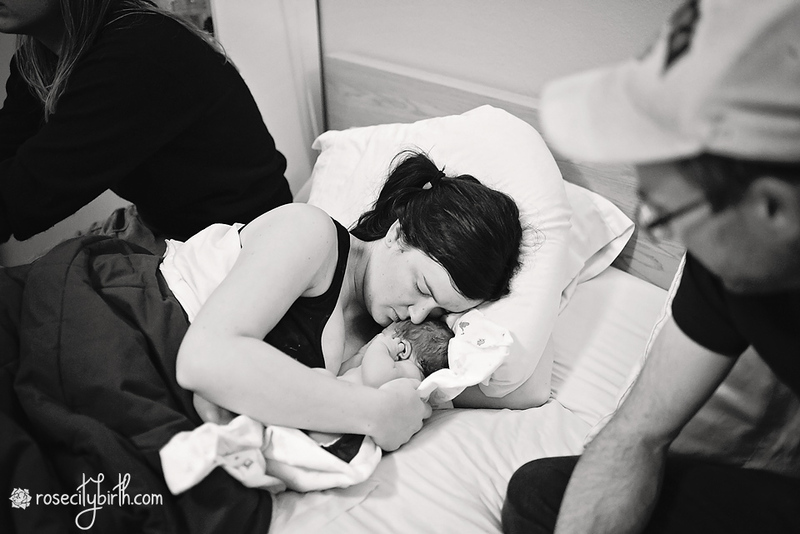 In this image the newborn exam is finished and our baby and I are snuggling up in bed. Our son weighed 7 pounds, 8 ounces and was 20.5 inches long (our biggest baby yet!). He had perfect Apgars and a squeeky clean bill of health. Around 5:30 AM I was left with my baby to snuggle and snooze. It was an absolute perfect beginning to the day and to this new life that lay next to me. In the back of my mind I knew it would be difficult for anyone to make it to this birth, but in the end it didn’t matter much. It was still a dream birth, made all that much more special with its intimacy. My husband is truly the hero of this story – not only coming to my aid by continuing to fight for the water birth until the end, summoning the team, and keeping his cool under tremendous pressure, but he did the one thing I could not do on my own when he caught our son in his capable hands. Birth never goes how you think it will, but I will be forever grateful for the way this one unfolded. All watermarked photos are the work of Rose City Birth. Please do not remove watermark.